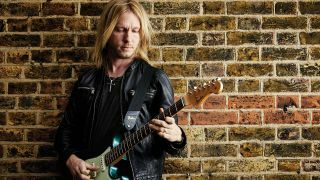 Louisiana-born prodigy Kenny Wayne Shepherd began his recording career at the age of 16. Since then he has become no stranger to gold and platinum albums and a career that has seen him share the bill with artists as diverse as BB King, the Eagles and Van Halen. Originally inspired to play guitar after meeting Stevie Ray Vaughan in 1984, Kenny began teaching himself from records in his father’s collection. Over the years he has become an indelible asset to the contemporary blues scene and a must-see live act. When not out touring with his own band - which includes Chris Layton, drummer in Stevie Ray’s band - he can be found playing guitar in Stephen Stills’ band, The Rides. In this masterclass, Kenny looks at various elements of blues rock soloing, from opening gambits to full turnarounds, underlining the principle that you can combine others’ licks and techniques to produce something original of your own. If you’ve learned all the minor and major pentatonic shapes going across the fretboard, the next step is to link them together ‘diagonally’ so that you can move between them effortlessly. This example details how you can do this in the key of E major, starting at the 12th fret, first string and ending with a flourish down on the bass E with an E major chord to round everything off. This example Takes the idea of moving ‘diagonally’ through the pentatonic positions a step further. The most important thing here is to take note of all the slides the join the pentatonic jigsaw together: the key is fluency and the trick is to begin practising slowly and gradually build up speed as you gain confidence. Here, Kenny demonstrates his “if in doubt, play Albert King’s licks” idea with this classic phrase at the 10th position. If you want to get it spot on in terms of accuracy, listen to the vibrato - especially on that penultimate note - it really makes all the difference! This is a four-bar string bending masterclass, apart from anything else, so be sure to hit the target dead centre in those opening statements. There’s a treasure trove of classic Albert King licks here: watch the vibrato and pay special attention to Kenny’s phrasing in the final two bars. In order to give the illusion of speed, you can combine hammer-ons and slides where the picking-to-note relationship is greatly reduced. This is used by just about every blues player from Albert King to Joe Bonamassa. Kenny references Son Seals, the Arkansas-born bluesman, for this tension-building repetitive slide and bend combo. You’ll hear this throughout blues guitar’s history - an essential technique to add to your portfolio! Another lick that highlights the usefulness of sliding between pentatonic positions. Your knowledge of all fi ve shapes needs to be fluent for this and so, if you’re not sure where you are, try mapping out a ’board’s worth of B minor pentatonic so you can see where this lick is placed in context - then you’ll be able to use it in other keys, too. Here, Kenny deMonsTraTes how you can combine infl uences and turn them into something unique with this turnaround sequence. Take a little Clapton, add some BB King, sprinkle with SRV… and voila! Combining a few more influences - notably Muddy Waters and Johnny Winter - results in this turnaround lick, which is far more ‘open’ than the last, but a great demonstration of how sometimes simple is best.